Going way back, before jazz, before the blues, one of African American music's first expressions was through brass bands. 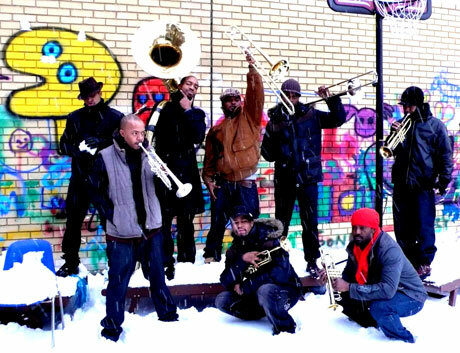 The Hypnotic Brass Band updates this ancestral sound for a new century. The Ensemble's music is a celebratory combination of hip-hop and funky, jazz-derived arrangements. Composed of seven horn playing brothers and a drummer, the family affair's patriarch is Phil Cohran, onetime Sun Ra Arkestra member and co-founder of Chicago's celebrated jazz organization, the AACM. Trumpeter Gabriel Hubert says that their background with cosmic, collective music gave them the view that their music should have "no boundaries. One of the reasons we never put lyrics on our music is cause then people can categorize it," he says. "With no lyrics, it keeps our boundaries open." Given that they made their reputation busking, such an outlook makes sense. Now with five albums under their belt and a guest spot on Maxwell's big comeback single, they're taking their music to a bigger audience. Boutique label Honest Jon's has released their new self-titled album, a typically soul-igniting record guaranteed to be one of this summer's soundtracks. "Hip-hop is the music we grew up with, when we wanted to get away from the things our parents wanted to put on us and do our own thing, we gravitated to it. We don't actually construct our music conventionally, we construct it in a rap form where you have a chorus then you have different brothers conveying different thoughts in the song through 16 bar solos." Hubert's assessment of hip-hop pretty much sums up the band: "It's full of life, it's forever changing."